BTC, ADA, BAT and ZEC near term support? Possible bull trap. Bitcoin has found some short term support against some key technical zones. It is also against brand new time pivot. But many other altcoins are also at or near similar conditions – conditions that could entice more buyers before another drop. 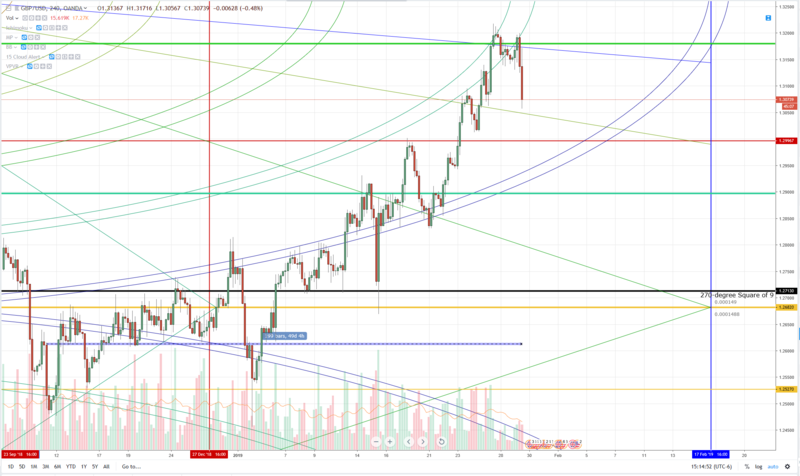 Yesterday’s low 3337.87 was also the top of the current arc and price has found support against that arc by following its contour throughout the current daily trading session. Prices have continued to consolidate and have not moved beyond that arc. It could be a signal that price is waiting for the appearance of the first time pivot in the current Law of Vibration cycle, which shows up on January 29th. These time pivots act a source of probable changes in the current trend. In essence, they act as a source of resistance in time to the current trend – reversing it. Now the length of the reversal is very difficult to determine because a trend could only reverse for a short period of time (3 to 7 days) or it could exist for another 24 days until it reaches the next time cycle on February 22nd. However, because of the proximity that price is at in relation to the Volume Profile, it is a hairsbreadth away from falling into a Low Volume Node and, thus, moving price down another -25% from it’s present value area to the 2500 value area. But Bitcoin isn’t the only crypto showing some hints of support. Cardano (ADAUSD) is showing some similar support levels – with price finding support against the current arc it is trading in. Generally, prices do not like to sit inside the two arcs, price likes to move out of it and move swiftly. Part of the problem with prices moving lower is that the 50% Fibonacci retracement is acting as a stiff level of resistance. The volume, however, may be telling us that we should expect some lower price action. While yesterday’s close saw prices rally to retrace over half of Monday’s entire trading range, there has yet to be any of that conviction from the bulls on the Tuesday trade. Prices have remained fairly even with the current distance between price and the daily open to be moot. Basic Attention Token (BATUSD) could also be showing some signs of support, with a more favorable position to see some higher, imminent moves than Bitcoin or Cardano. The 27th of January was the end and beginning of a new Law of Vibration cycle for Basic Attention Token. While prices have continued to fall with the aggregate market, there is strong near term support (at least initially strong) with the 1×4 angle just below. 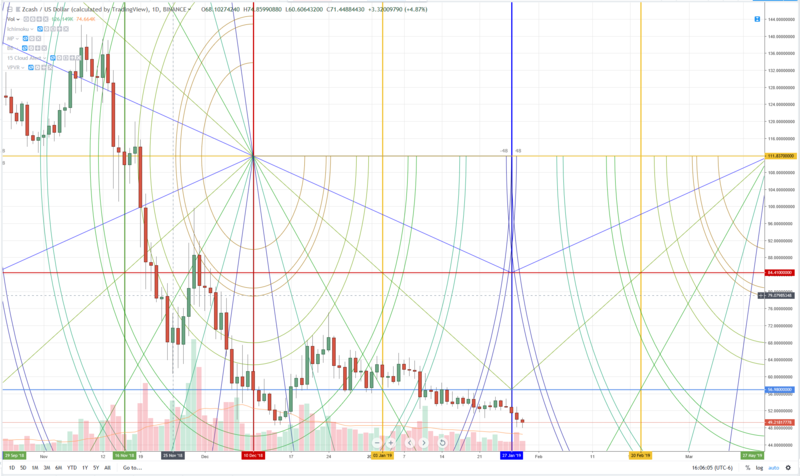 Additionally, it can take a few days for price to react to a time cycle so there is still plenty of time to observe if Basic Attention Token will give a bullish response to its time cycle. 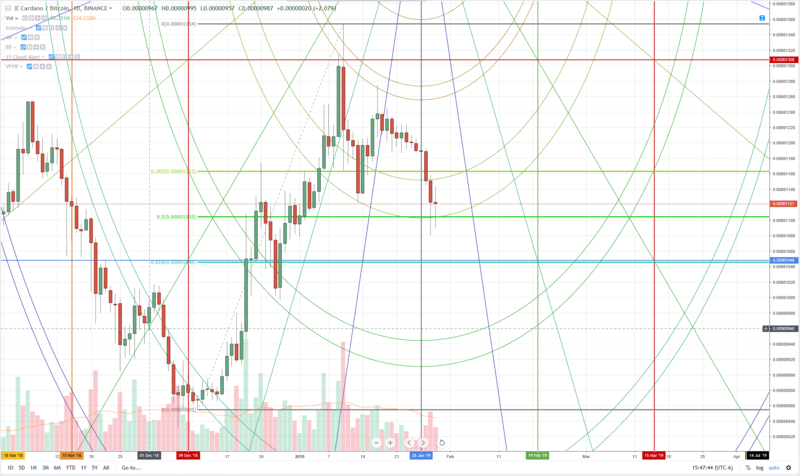 Zcash (ZECUSD) has printed not only new 2019 lows but new all-time lows over the past three days. This has occurred within two days of its new Law of Vibration cycle that ended and began on January 27th, 2019. Price action wise, it appears we are finding some buyers. If the wicks are to be believed, then we do have some potential to move higher. The sticker here is the area between its present value of 49.35 and the next major support zone. 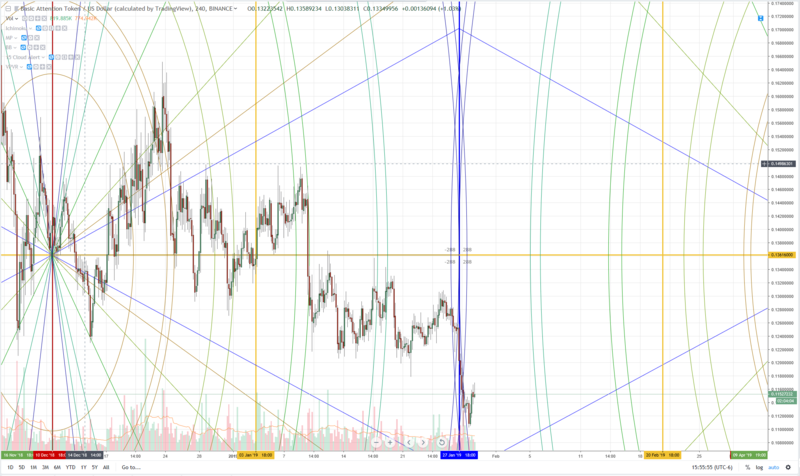 It’s all the way down below at 29.55 and ZECUSD is about 5-days away from where we run into a new arc that could act as another piece of resistance pushing prices lower. I know I would feel more confident in a move higher if the volume were somewhere close to yesterday’s, but it isn’t.